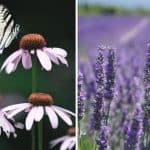 Why use screening in gardens? Garden screening is a great way to break up sections of your garden and create private areas for relaxing and dining. It also offers privacy from neighbours. A variety of materials can be used for garden screening, depending on your garden style and budget. As well as synthetic garden screens, plants make stunning garden screens too. Bamboo and grasses are just two plants which have become a popular choice among gardeners as they offer the totally natural option. 1) Create a beach feel to your garden with bamboo! 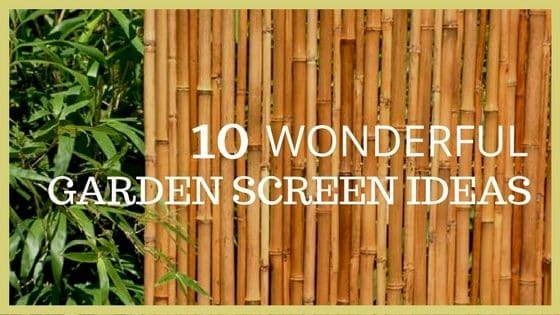 Transform your garden into a tropical paradise with bamboo garden screening. It’s the perfect way to cover up an old fence or create a section of your garden for relaxing in. Bamboo is a fast-growing and evergreen plant, which makes ideal use for garden screening. Bamboo roots can be invasive but you can create a productive screen which doesn’t grow too rapidly by choosing a clump-forming variety and planting it in containers. This will stop the plant from spreading too much and provide a restful garden screen. 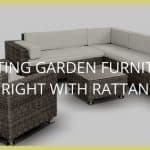 Add exotic plants around the screening area to give your garden the ultimate tropical feel! This eco-friendly garden screen is created using saplings cut from trees and fixed together with wires. It offers the perfect amount of privacy and shade for a garden and looks great in a natural setting. It also costs virtually nothing to make, although it will wear down over time. This garden screen is very similar to a ‘dead hedge’, where dead wood is used to create a barrier. Grasses make a beautiful, textural and low maintenance garden screen. Calamagrostis x acutiflora ‘Karl Foerster’ and ‘Overdam’ are excellent early season grasses, flowering in June. Create different heights with grasses for a natural garden screen. Smaller grasses work perfectly for small garden screens, whereas tall grasses can offer privacy to larger gardens or outdoor spaces. To give your garden a sense of modernity, steel fencing is a great perfect choice. Metal contrasts with plants and flowers to offer a hint of industrial design and edge. This alternative garden screening idea works perfectly with modern gardens and complements the metal garden furniture. Add a variety of plants and shrubs for colour, while maintaining a modern appearance. An espalier trained fruit tree will make a stunning and productive garden screen. Providing blossom in Spring and fruit in Summer or Autumn, it’s perfect for dividing up part of the garden naturally. Traditional English gardens are not complete without an apple or pear tree, therefore this garden screening idea works perfectly in a traditional setting. Kids love this type of garden screen as they can really get involved in the process. All you need to do is create a basic frame from wood and fill with logs, twigs, bricks and whatever else you can find lying around the garden. It makes the perfect insect and bug hotel and helps to encourage more biodiversity. Let the kids delve in and see what creatures they can find while enabling a perfect garden screen for your garden. It’s great for the whole family! Garden screening from neighbours is easy if you know how. Grow your favourite climbers up the trellis to create privacy for your garden. If you have a low fence, attaching trellis is a great way to save you money on a higher one. It also looks stunning when climbing plants cover the trellis with bloom. An evergreen, fast-growing plant such as ivy will offer low maintenance garden screening. Make your garden feel bigger than it is by adding mirrors or mirrored objects. Mirrors can be used to create the illusion of space and make an effective garden screen.To add depth to walls or fences, create the illusion of space in a certain area of the garden. Another alternative design is simple reed screening. 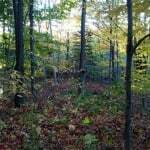 You can purchase this on a roll and fasten directly to a fence or stakes. The stakes can be driven into the ground and used as posts to fasten the reed screening too. It’s an easy way to a section of any area of your garden and there’s a wide range of reed screening available!